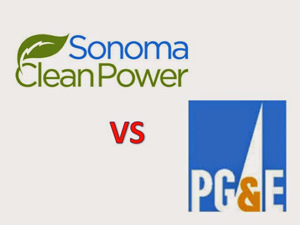 I am asked daily, “Should I opt out of Sonoma Clean Power (SCP) or stay with PG&E”. First a little background. I have been working with PG&E, interconnecting solar systems, for the past 10 years. While I have not always agreed with many of their policies, they are one of the “cleanest” utilities. They primarily burn natural gas, not coal. Recently PG&E has really made an effort to discourage solar by sponsoring legislation designed to make solar less attractive, minimize what they compensate solar customers for over-production, and to bar new entry/competition like SCP. I sat on the initial organizing task force for SCP, and was excited to have an option for myself and my customers. What is Sonoma Clean Power? A law passed 10 years ago allows communities to provide their own power choices, called a Community Choice Aggregation (CCA). SCP is a local CCA, a new Sonoma County organization designed to provided cleaner power at a lower cost, while providing local renewable energy and local jobs. SCP can design programs specific to Sonoma County, not needing to design them for their entire territory, like PG&E. SCP differs from communities like the City of Healdsburg, which has their own power company. 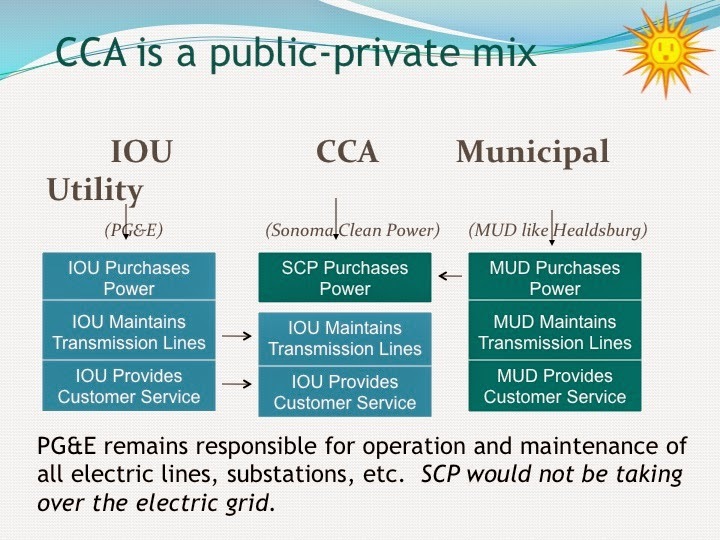 SCP is responsible for the energy generation, while PG&E still bills the customer and provides infrastructure support of the distribution facilities and transmission lines to the customer’s meter (see below). So let me tell you some of the reasons why I am going with Sonoma Clean Power. Their rates are 4-5% less than PG&E’s. SCP change their rates annually, while PG&E has already raised rates 3 times this year. SCP power mix is cleaner and greener with a +30% renewable mix to PG&E’s low 20%. And if that is not enough, I support their direction. They are committed to continually increasing green energy with a goal of 100%. They are also committed to installing and using local renewable energy sources, and to the creation of local jobs. For solar customers, SCP offers a $0.01 payment over retail rates for over-production, and energy credits do not expire at true-up periods like with PG&E. SCP will write you a check if your over-production exceeds $100. They are creating programs that encourage local renewable energy systems, like solar, while PG&E is trying to make these processes more difficult. To summarize, SCP offers lower cost, greener energy, local jobs, local control, and a commitment to local renewable energy. Why would you go anywhere else? Hello Joe – I think i looked at your property a while back – how is the solar project there? What is SCP doing to offset the many fees PG&E is charging solar customers that have switch to SCP?